A new way to sync our iPhones and iPads might be on the way soon enough, doing away with those USB cables, which can be a bit of a nuisance at times when looking for a quick sync. A bright spark of a developer has come up with a new App called Wi-Fi Sync, which enables users to wirelessly sync their iPhones, iPads and iPod touches to their computer using their home wireless networks. Opera, one of the worlds most popular browser makers has today revealed that they intend to launch Opera for the iPhone. The parent company to the popular software says that the new browser will load webpages up to six times faster than Safari since it compresses content when downloading a webpage for viewing which in turn can also reduce browsing costs significantly per MB, which means the GB which O2 grace us with goes a bit further. The popular browser, turned app will feature tabbed browsing, google search in-built, speed dial showing thumbnails of your favourite websites and a password manager. All of which are much, much handier than features in Safari for the iPhone, which is still unchallenged in terms of web browsing on what is the worlds most popular, and infamous phone. Opera are also sounding quite optimistic about their chances of having the app approved by Apple. The hardware, and software giant has been typically hesitant of allowing apps which mimic too closely the functions of its own native apps to appear on its store. Opera may be betting on the large amounts of negative criticism which Apple have been attracting thanks to their strictness, when their own browser goes through the approval process. With the upcoming release of the iPad, which may still revolutionise portable computing, Opera may also be looking to jump on board from the beginning, offering users an alternative to Safari when surfing any where with a nice big 10” screen and making the iPad feel much more like a full computer, with choices among browsers etc. Rather than a big iPhone. Having proven themselves time and time again on Macs and PC’s for being able to produce solid and fast browsers, the software company should do well against Safari, which has seen recent fall backs on the browser market share stats with the arrival of Chrome on the scene. Opera is already on pretty much every other platform, and is the worlds most popular mobile browser, so landing on the app store is really allowing it to cover all the basis, and should give Safari a good run for its money. There’s no doubt that the Opera iPhone browser will be a brilliant app, well worth the download, that’s if it gets approved. Kindle comes with Apps, remember Snake anyone? Amazon appear to be taking a page from Apple’s book for the Kindle with allowing for the creation of apps by opening the platform up to developers, and bringing out its new ‘Developer Kit’. The popular e-reader will be taking advantage of it’s 3G technology and long battery life to allow for the development of various apps to be used alongside it’s native functions. So far two companies are said to be creating apps for the Amazon device; Handmark who are working on a Zagat guide, and Sonic Boom who will develop various games and puzzles. The developer kit will be launched in February in beta version and will come packed with sample codes, Kindle simulator and documentation which will all be able to run on Mac, PC and Linux computers where a developer can build and test their creations. Although the name ‘app’ might make people think of the ever increasing and complicated apps of the iPhone/iPod, the Kindle’s apps will be slightly more watered down; being constrained by the black and white e-ink, and the reader’s hardware – this will probably make for relatively simple apps, however it is a beginning to a potential trend for amazon to make its reader a much more all-in-one device. This news comes ahead of Apple’s expected iSlate/iPad announcement, which seems ever harder to escape comparisons to as the technology and retail worlds pays close attention to the company and ready their own products in the e-reader and tablet markets for a fight for market share. This may be what Amazon is intending to do, by allowing for apps to be developed, they create a watered down version of what the iSlate is expected to be and may be able to hold out against Apple making deep inroads into the e-reader market, however by this point it might be too late. Excitement over Apple’s show is at fever pitch, and few seem to be paying attention to much else. This is a welcome addition to an already solid product, the questions left are; will people take to it and is it too much for what is, in essence, supposed to be a book? What will the apps cost? 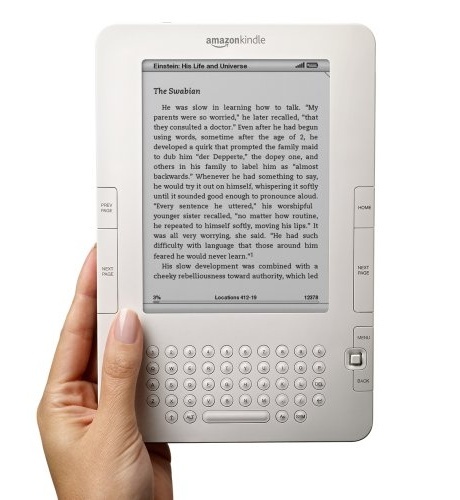 And will it be enough to keep the Kindle going against Apple?